If you have a brand that’s been around for a few years, one of your biggest challenges from a design perspective is maintaining your current equity while making sure your brand is relevant enough for modern consumers. It’s a delicate balance! If you’re not familiar with the term “brand equity,” let me give you an example. 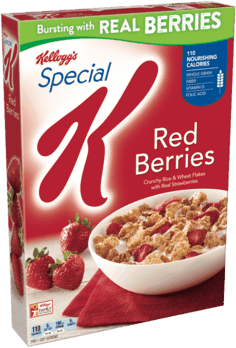 My favorite breakfast cereal is Special K. You’d recognize it; it’s the one with the giant red “K” on the package. My favorite flavor is Red Berries, which is easy to spot on the shelf because of its vibrant red color. There’s no way I would be able to find that cereal on the shelf. I might not even recognize it as my favorite cereal when I saw it. 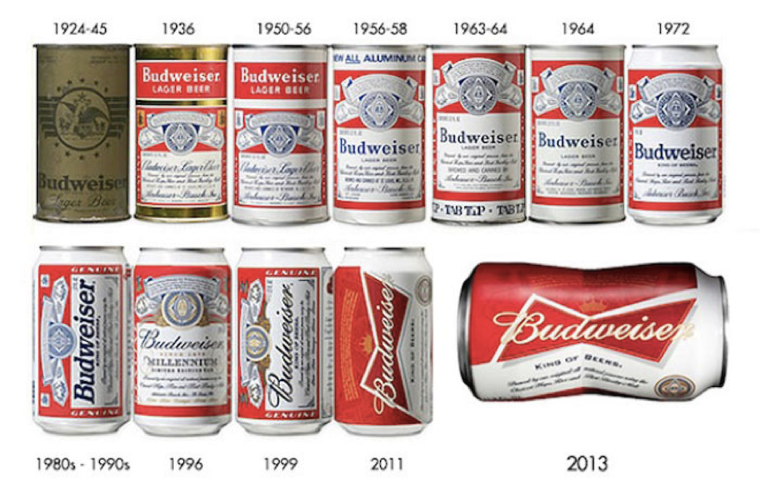 Instead, Kellogg’s has been very intentional in how they’ve evolved their brands over time. The giant “K” of Special K cereal is so integrated in how their customers recognize the product, it has hardly changed in decades even while the overall aesthetic has been modernized. We like to call brands that have done this well “heritage brands.” They are able to maintain their brand equity over years and years by carefully updating their designs without losing the essence of their brand. What lessons can we learn from these successful heritage brands? Your brand has a unique DNA that is truly one-of-a-kind. You have your origin story, your values, and your mission. If you haven’t already, take the time to define your brand values clearly and concisely. What does your brand stand for? If you have a clear sense of your brand identity, that can serve as a guiding light as you go through any change. If you have a brand that’s all about serenity, mindfulness and the environment, it probably doesn’t make sense for you to use intense colors and wacky fonts, even if that’s what your competitors are doing. It’s very tempting to chase design trends whenever the next new thing becomes popular. However, by saying “me too!” to those trends, you can become lost in the sea of sameness. While you want to look appropriate for your category and your target audience, don’t hesitate to be a little different from everyone else. Look at Pepsi, for example. Their biggest competitor, Coca Cola, has indisputably owned the color red for almost a century. Pepsi, on the other hand, was the All-American brand that always had a red, white and blue can. Then, one day in the 90s, they suddenly owned the color blue. By owning the color blue in their product category, Pepsi is now able to receive instant recognition on shelf. Being different from their main competitor was a brand imperative. Your branding needs to stand the test of time so that your products will be recognizable for a long time to come. Especially in the CPG world, it’s very important that your brand doesn’t completely change overnight. In addition to your customers, you may deal with complications from your printers or your retailers if you change things too suddenly or too drastically. This is another pitfall of chasing design trends. If you choose a very trendy design, you run the risk of looking very dated in a few years when the popular aesthetic shifts to something else. What will people think of “Millennial Pink” in a few years? Above all else, you want your brand to look undeniably like itself. This seems obvious, but disjointed branding is all too common and can lead to a lot of consumer confusion. Perhaps your brand has been around for 10 or 20 years and now you want to launch a new, organic line. You may be tempted to use an all-new color palette, with all-new claims on the package. You may even take the opportunity to update your logo, since you’re going through a new design phase anyway. The result will be a package that looks so different from what your customers are used to seeing that it will be like you started the company completely from zero. Instead, take the time to ensure that all of your branding and marketing looks cohesive. This can include your logo, your packaging, your website, your social media posts, your print ads, and more. Have you ever heard the fable of the boiling frog? If you put a frog into boiling water, he will immediately jump out because he knows it’s too hot. But if you put that same frog into cool water and then slowly, over time, bring the water to a boil, he won’t realize the danger until it’s too late. It may be a morbid analogy, but I often think of that frog when dealing with a long-term brand strategy. You want to make changes so carefully that your customers don’t even realize the difference, and yet you’re always perceived as a modern, relevant brand. Good brand building takes planning and forethought. If you look at the food and eating trends that have existed over the last 100 years, it’s clear that we have come full circle. Prior to the 20th century, everyone ate more natural foods. They ate seasonally grown fruit and vegetables, visited the local butcher, and baked their own bread. And then everything changed. The two World Wars demanded food that could be preserved as it was shipped to the front lines. As more women entered the workforce, convenience became king in the kitchen. Industrialization and innovations in food manufacturing made it easier than ever to mass produce food. Today, it’s to the point where 70% of the food we eat in America is processed. And yet, over the past ten years or so, our culture has been making its way back to “real food.” With the help of new research in health and nutrition, food documentaries, and FDA regulations that expose what’s in our food, we’ve finally reached the end of our processed obsession and are back to believing that natural, clean food is best for our bodies, souls and overall health. But is “clean label” real? Is it even possible? Isn’t everything you buy from a grocery store packaged, processed and shipped? Clean label means that we are moving toward ingredient decks and recipes that remove gums, stabilizers, preservatives, additives and more. It means that we are trending to make our food more recognizable, understandable and real. It does not mean that manufacturing is dead or that processed grains, sugars and spices will wither away but that the ones we choose to eat will be closer to nature. Should your brand move toward a cleaner label? 1. Modern consumers favor healthier foods. Today’s shopper wants to know what is in their food and be confident that it is healthy. According to a recent survey, 27% of consumers say that health concerns influence their food choices and 41% believe that limited or no artificial ingredients or preservatives define “natural” food. Your product will better appeal to these customers if you formulate the ingredients and position your brand with health and transparency in mind. 2. Millennial shoppers demand good behavior from companies. The Millennial generation, which is aging into their 30s and making up a larger percentage of the grocery-buying population, is very mindful that what they purchase is good for themselves and the world at large. They care about the impact of food on the culture, on the environment, and on their bodies, and they are more likely to buy your product if your label reflects clean, natural, sustainable ingredients. 3. This trend toward health and simplicity will benefit everyone. Unlike other questionable low calorie, low fat, low carb fads and trends over the past few decades, the clean ingredient movement is undoubtedly a healthier alternative to food that is laden with additives and preservatives. As more families and more companies adopt the clean eating mindset, the healthier our country will be. This is a wonderful and important movement for both the food industry overall and for our own families. I have been watching this trend truly blossom over the past few years and I’m hopeful and excited to see it become more prevalent, recognized, and celebrated. Does having a clean label matter to your brand? Let us know in the comments! Last night, I mentioned to my husband that I want to buy a handbag from FEED. For those who are unaware, FEED is a fashion company that provides food for malnourished children with each purchase. Their brand mission aligns with my desire to feed people and I like handbags. The answer is a resounding YES and this “trend” is likely here to stay for many years to come. I have been talking to clients and colleagues for years about the increase and prominence of social impact marketing on today’s buying habits. Many studies show that when all else is equal – price, promotion, product quality, etc - companies that give back to their communities win at shelf, both online and in brick and mortar stores. We have also seen a rise in these efforts among both large CPG companies as well as in small startup companies. Whether they are introducing new products or new programs, companies today are focused on more than ingredients, process, and profit – they are looking to make a difference. How can your company successfully develop a social impact program? Many CSR programs fail to make an impact because they don’t make their purpose clear. Donating a percentage of your sales to a random charity that you picked out of a hat won’t mean anything to your consumers. Any give-back program you develop needs to align with your company values and your brand mission. Ben & Jerry’s, for example, has never been shy about their views on politics or social issues. During the contentious election season last year, they released a new product: Empower-Mint, a delicious blend of peppermint ice cream, fudge brownies, and fudge swirl. That flavor may be appealing to your taste buds, but it also vocalizes the company’s support for the Voting Rights Act and increasing voter turnout. Whether or not you personally agree with their views, Ben & Jerry’s successfully sells more ice cream because they are vocal about the purpose of their social impact programs and their customers identify with their message. Six years ago, I had the opportunity to visit the corporate offices of Johnson & Johnson and sit with the Chief Procurement Officer for lunch. He shared with me all the programs that Johnson & Johnson have in place, but I had never heard of them. They were clearly written in their annual report but not explained, promoted and delivered to the public. Taking care of the community has, in the past, been more of a private endeavor for many large and small companies and it is now rising to surface. If your company has a social impact program in place, support it with PR and get your message out there! For and CSR program to make any difference to your business reputation and your sales, people need to be aware that it exists. A few years ago, I read a book called Evolved Enterprise by Yanik Silver. It outlines 11 social impact models and talks in detail about why purpose-driven business models are not only growing in popularity, but are becoming a necessity to connect with consumers. I highly recommend that you read it. The book inspired me to create an initiative called Labels4Good, which I launched at the Global Sustainability Summit last summer. The program was designed to give grocery packaging a purpose by donating food and resources to community food pantries around the country with every box sold. Companies could opt into the program and promote their involvement with a label on their packaging. The challenge, I soon discovered, is that social impact models cannot be purpose driven only. They must first and foremost deliver clear profit. If it doesn’t strengthen the bottom line either by building goodwill and brand equity, then it must also deliver increase sales and revenue. Labels4Good was a purely philanthropic endeavor that I created from my own desire to feed people, which at the end of the day isn’t enough to build a successful company. I haven’t given up on Labels4Good completely, but it’s an important lesson to always remember that businesses need profit in order to survive, even if the philanthropic intention is good. Overall, I love this social impact trend, the purpose and the result. However, I caution everyone, business owners and consumers alike, to be aware about how you engage and interact with them. They can help us tackle global challenges, spread the word about social issues, and make us feel a little better about our desire to purchase yet another handbag. How has social impact marketing effected your purchasing behaviors? What companies do you admire most? We’d love to hear!